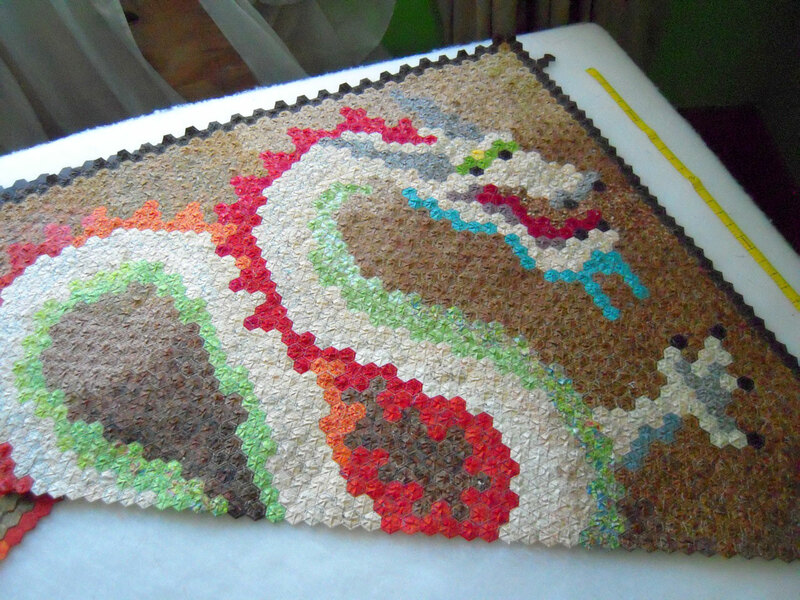 Since I’m needing to do a Dragon Quilt update… I thought it would be fun to show the back of the quilt… the B-Side. 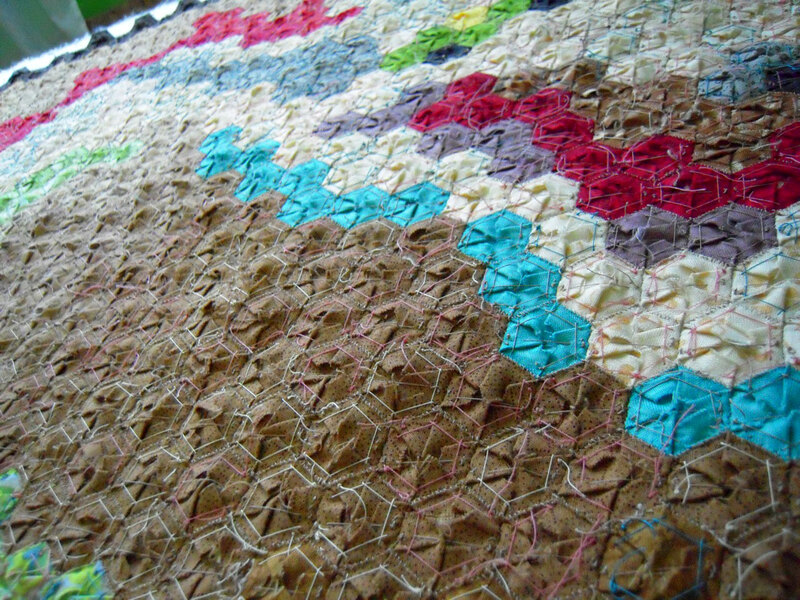 Funny how all the work of a hand-stitched quilt gets covered up with the quilting, no one gets to see all the actual work. I’m OVER halfway!! Actually 3 strips over the halfway-point, so each strip from here on in will get shorter and quicker to stitch. 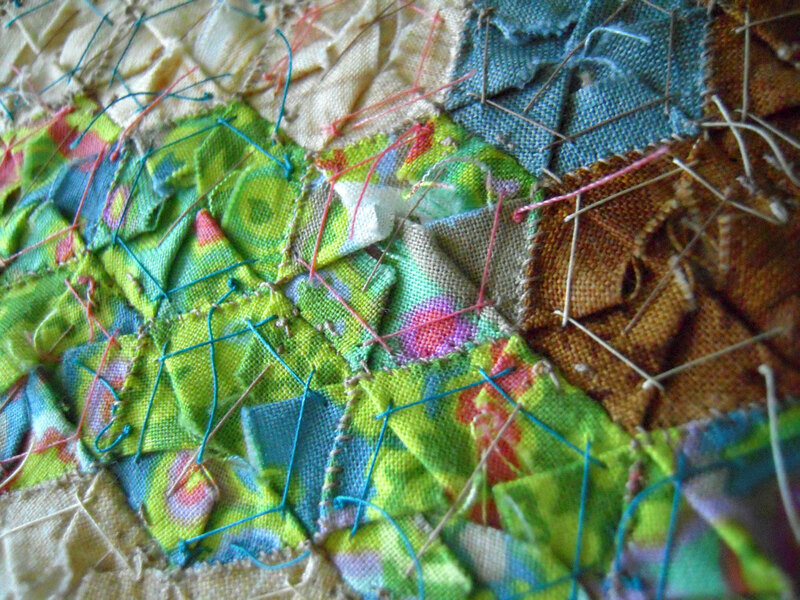 When I stitched the long strips of hexies together, I used a ladder stitch, and now, sewing the strips to each other, I’m using a whipstitch which is working very well to keep the quilt nice and flat. There are still papers inside each hexie that I will need to take out… but I don’t need to think about that quite yet! I do have a plan for that, and I think it will go quickly enough. I’ll post about it when I get there. For now, I’m just keeping on~ I’m figuring at least 2 more months to finish the top of this quilt… then onto the actual quilting!! Ideas for quilting patterns anyone?? I’m thinking of free-motion-quilting along with some hand-quilting ~ so there are lots of options. This is amazing. I love it! And it looks great from the back, too. Glad to see you again. Wow! You are coming right along. Does Mr. Dragon breathe fire? I'm thinking flames. Just found your blog from pinterest. Wow, this quilt is amazing.